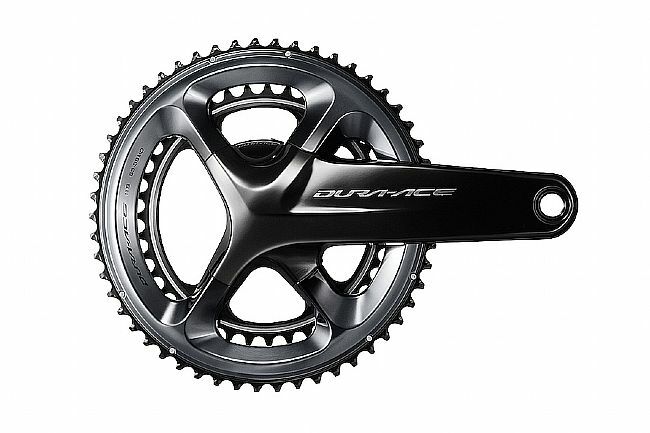 The Shimano Dura-Ace FC-R9100-P Crankset adds in precise, reliable real-time power measurement and analysis to Shimano's top-tier crankset. Featuring Hollowglide chainrings and a Hollowtech II crank construction, this expertly engineered crankset boasts stiffnes gains and weight losses over previous Dura Ace crank iterations, and it's ready for today's modern race geometries with a re-positioned inner chainring to improve performance with 135 mm rear-spacing frames and short chainstays. The real stand-out of feature of this crankset is its fully-sealed integrated crank-based power measurement system. Offering accurate multi-position measurement, the R9100-P is the essential performance tool for every cyclist who wants to achieve their true potential. Featuring an internal battery, the power meter recharges via a magnetic attachment for quick, easy charging. Available in multiple crank lengths and gearing options. Compatible with Shimano BB-R9100 and BB-R9100-PB bottom brackets. Compatible with 3rd party displays.